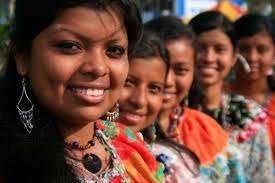 Indigenous peoples of Costa Rica, or Native Costa Ricans, are the peoples who lived in what is now Costa Rica prior to European and African contact and the descendents of those peoples. Approximately 63,976 indigenous people live in the country, comprising 1.7% of the total population. Indigenous Costa Ricans strive to keep their cultural traditions and language alive. In 1977, the government passed the Indigenous Law, which created reserves. There are a total of 24 indigenous territories located throughout Costa Rica. After only gaining the right to vote in 1994, they are still fighting for their rights, particularly regarding the government taking over their land and ignoring the articles which protect them. While indigenous people have struggle for legal recognition of their rights, Costa Rica did sign the UN Declaration on the Rights of Indigenous Peoples in 2007. Christopher Columbus arrived in Costa Rica in 1502 on his last trip to the Americas. Costa Rica received its name from Gil Gonzalez Davila when he arrived and thought he found the most gold he had ever seen; therefore naming it the “Rich Coast”. To the Spanish, it was less organized from other indigenous groups they had discovered, mainly because they lived in separate groups rather than one large group. During the colonization, Costa Rica was very poor, mainly because it was isolated from the majority of the Spanish Empire. Natives had lived in Costa Rica for what stretches back to 10,000 years before this, but the cultures were destroyed when the Spanish arrived. Colonies that were set up originally weren’t successful, because of disease as well as the tropical rain forests. Costa Rica didn’t become a province of Spain until the 1560s, when a community was created that used the volcanic soil for agricultural purposes. By the time that Columbus arrived, there were about 20,000 Costa Rican natives, but this number greatly declined. This was primarily due to disease, particularly smallpox as well as the fact that many indigenous were enslaved to work and oftentimes escaped from them.